Higher quality product... reduction of losses... products with more uniformity... lower operating costs in today's global market, these are goals we strive to achieve. Those who don't, face lower sales and eventually loss of market share. 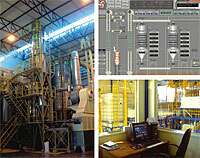 We constantly look for ways to upgrade and improve each phase of rice processing. Traditionally we have done so by upgrading a machine, adjusting flow controls or reconfiguring sections of our plants.But the real key to absolute precision performance is to look at the process as a whole. Instead of managing particular phases to their maximum efficiency, maximize how they work together. The key is automation in our mills.